This is much, much more than a music CD; this is history, tradition and an echo of life as it once was. 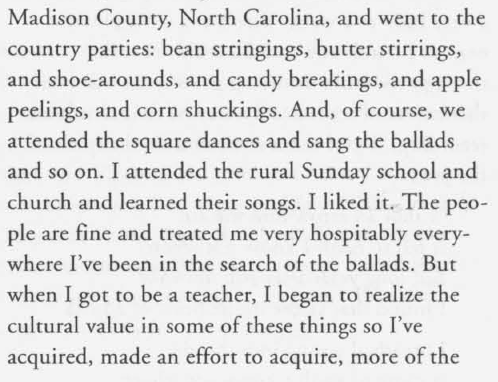 Having been born and raised in the North Carolina foothills, this music is especially significant to me. 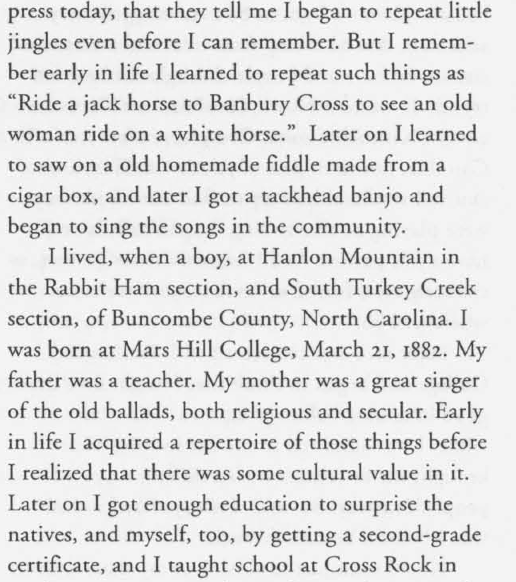 In the late 19th and early 20th centuries, music was a way of life in the North Carolina mountains; thanks to Bascom Lamar Lunsford, that old way of life and culture is not completely lost to us in this modern age. Lunsford had many professions during his long life, but the music he grew up with was his passion. 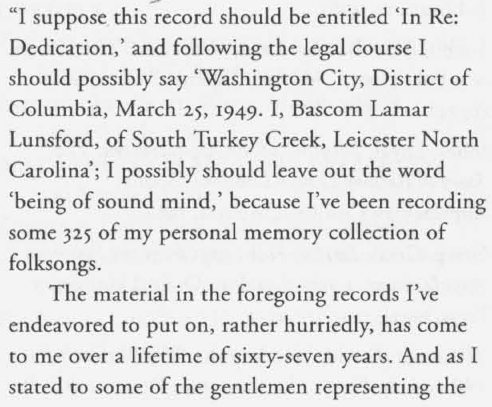 No American contributed more material to the Archive of Folk Song than Lunsford, and all but five of the recordings on this album come from his “memory collection” recordings made at the Library of Congress in 1949 (the “memory collection” actually consists of no less than 318 songs); the other five were recorded for Brunswick Records in 1928. 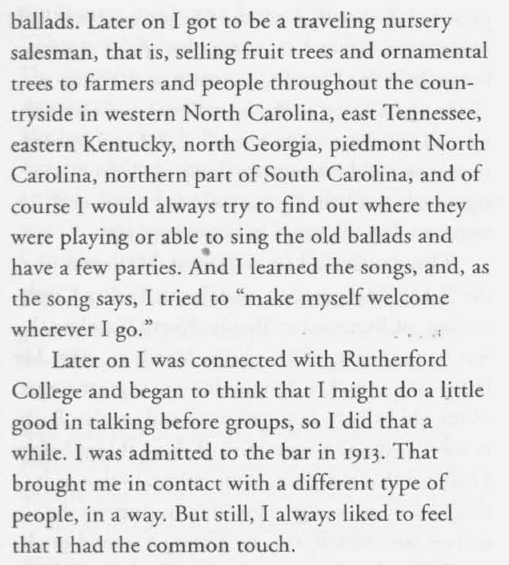 ” It is said that Bascom Lamar Lunsford would “cross hell on a rotten rail to get a folk song”—his Southern highlands folk-song compilations now constitute one of the largest collections of its kind in the Library of Congress—but he did much more than acquire songs. He preserved and promoted the Appalachian mountain tradition for generations of people, founding in 1928 the Mountain Dance and Folk Festival in Asheville, North Carolina, an annual event that has shaped America’s festival movement. Loyal Jones pens a lively biography of a man considered to be Appalachian music royalty. He also includes a “Lunsford Sampler” of ballads, songs, hymns, tales, and anecdotes, plus a discography of his recordings. Known in his lifetime as “The Minstrels of the Appalachians” and “The Squire of South Turkey Creek”, Bascom Lamar Lunsford was a man of multiple endeavors, with a calling to preserve and entertain with the folk heritage of the Appalachian mountains where he spent all his busy life. Born in 1882 in Madison County, North Carolina, he was raised in a middle-class family which put education and arts above all things but stayed close to the soil and the traditional values of the Southern mountains. Bascom would be at ease all his life both with urban and country people, making a bridge between both worlds, the old and the new, the entertainment and the scholarship, the stage and the living-room, the church and the dance floor. He claimed that he visited more homes in the mountains than anyone, and thanks to his early occupations of fruit tree seller and beekeeper, he knew well the backwoods people, who were the good musicians and singers and managed to collect hundreds of songs, tunes and tales from them. Working officially as a lawyer, he nevertheless devoted most of his energy to promote musicians, organize festivals, record and collect folk music with a zeal and passion that was legendary. He “would cross Hell on a rotten tail to get a folk song”. His major achievements were the Mountain Folk and Dance Festival he created in Asheville in 1928 (and sill running today!) and the impressive number of folk songs and tunes he recorded for the Library of Congress (more than 300 items).